Although this blog is mainly about avoiding fake, processed foods my life doesn’t stop there. It starts with the Weekly Personalized Chores. 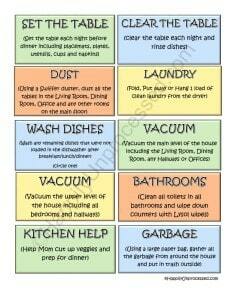 These are chores they have to do every day. We fill these in together. 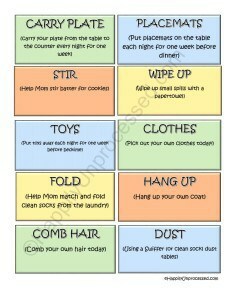 The kids ‘choose’ what chores they feel they are most able to complete independently. 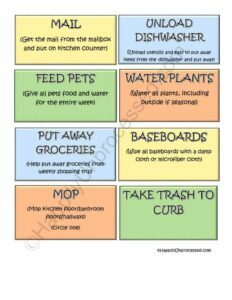 Allowing the kids to choose chores with you gives them more of a voice and I have found they are more successful in completing them. These chores are the basics. They are not back breaking, strenuous or take a lot of time. They should be age appropriate and set your kids up for success. For example, taking out the garbage, making their bed, etc. 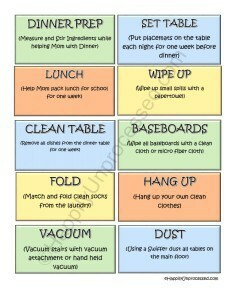 When your kids complete the basic chores they are paid a BASE salary which is at your discretion. 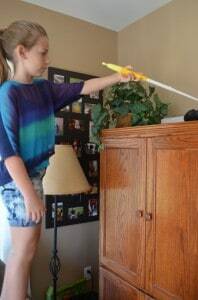 The Work for Hire Chores are chores in which the kids earn EXTRA money doing chores that I normally would do. The rule, however, is the kids HAVE to complete their Daily Personal Chores BEFORE doing any Work for Hire. This motivates them to complete their daily chores. I like this idea. 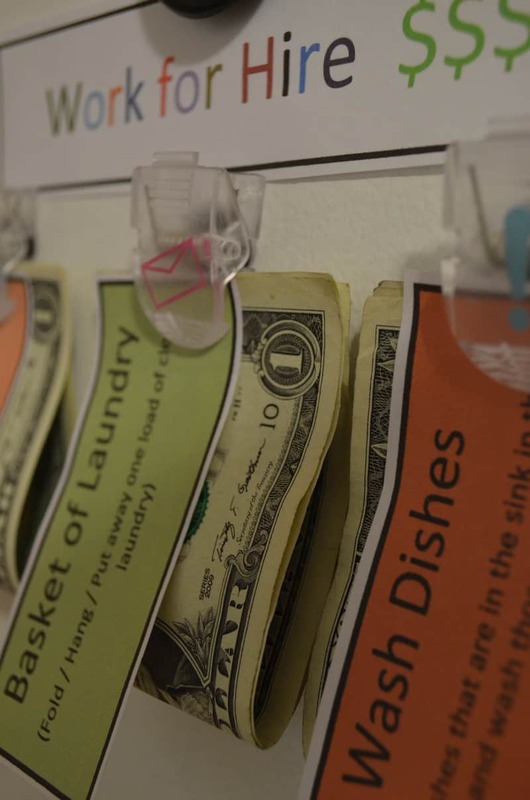 The amount of money for each chore depends on you and your financial situation. I don’t know about you…. but we don’t have all this extra cash laying around so my kids can gobble it up. I usually do a dollar or two for each chore. We have 2 large dogs and Doodie Duty is one of them. That one gets $4 !!! But most of them are between .50- $1.00. I think total we lay out $15 for all the chores. Some of them (like setting the table) just sit there day after day. My daughter says, “it isn’t enough money”. So not all the money gets used up each week. 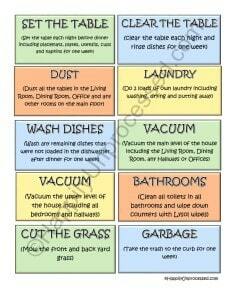 The chores go from Sunday to Sunday and any money leftover goes towards the next weeks chores. 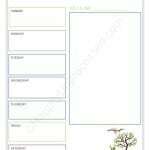 Put the chore charts in plain view. If you’re ok with things hanging on the fridge put it there. I chose to set this system up on the back of our door in our mudroom. The door is metal and it works perfectly with magnets. Don’t expect your kids to do the same quality of work you would. 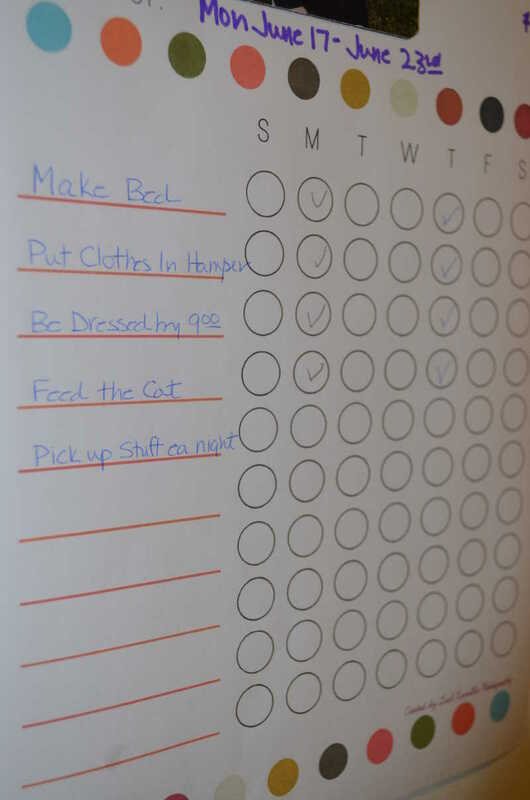 I chose some pretty foolproof chores so the kids couldn’t ‘fail’. It’s meant to give them some added responsibility while building self esteem. If you badger them about HOW the job was done it could be very self deflating to them. Bottom line …….. I’d rather see this picture in my house any day! 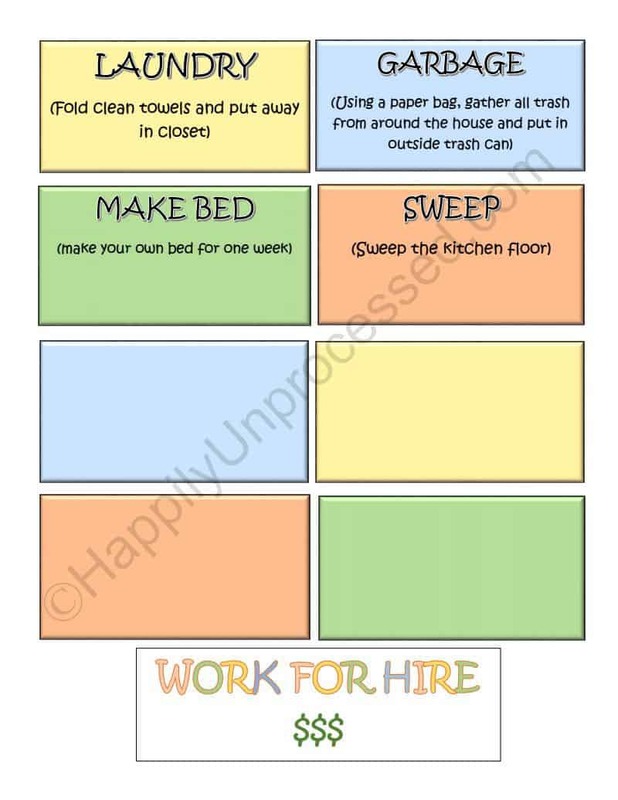 I am so happy to say that our Work for Hire Chore Chart system has gone viral with over 100,000 pins, shares and likes on social media! You can now download the Work for Hire Chart and implement it today in your own house! It’s been revised, enhanced and even is broken down by age group! I really enjoy using this system, even as my kids get older, and I think you will too. Please let me know your thoughts and comments! 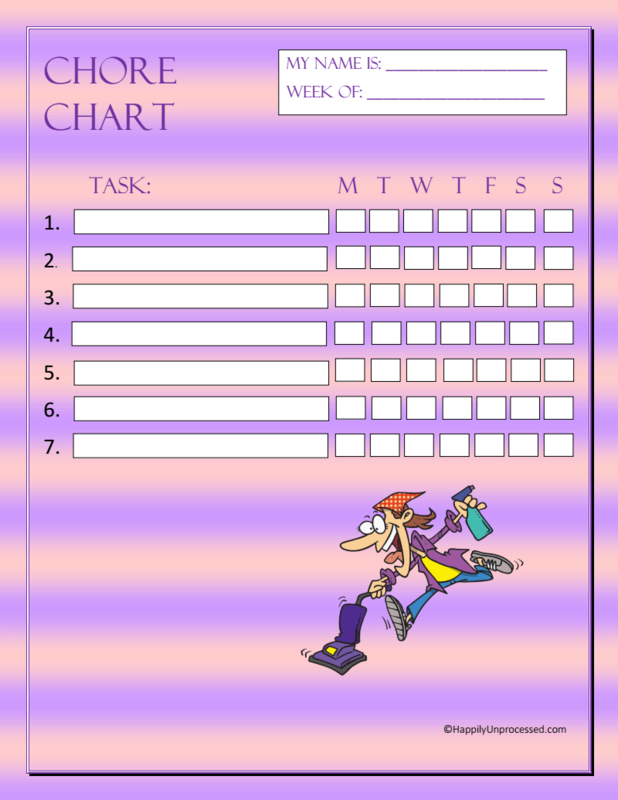 Also included is our Daily Chore Chart for FREE! Thank you to everyone who found us through Pinterest! I just purchased the chores for 9-11 years old but now I am confused. I thought it was going to take me somewhere to print that and the chore chart that it said was free. Are these items being mailed to me or am I doing something wrong where I can print them? oh good! Hope they help. They really changed things in our house! 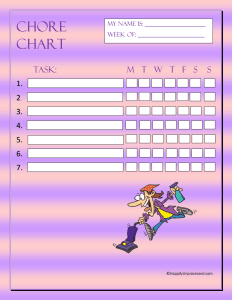 If you have the personal chores chart please email me. Love this idea. If your kids don’t complete all the basic chores – do you prorate your base salary? Or is it all or nothing? Just curious how other parents address this. Thanks! thanks for the tips! Cozette sent me! 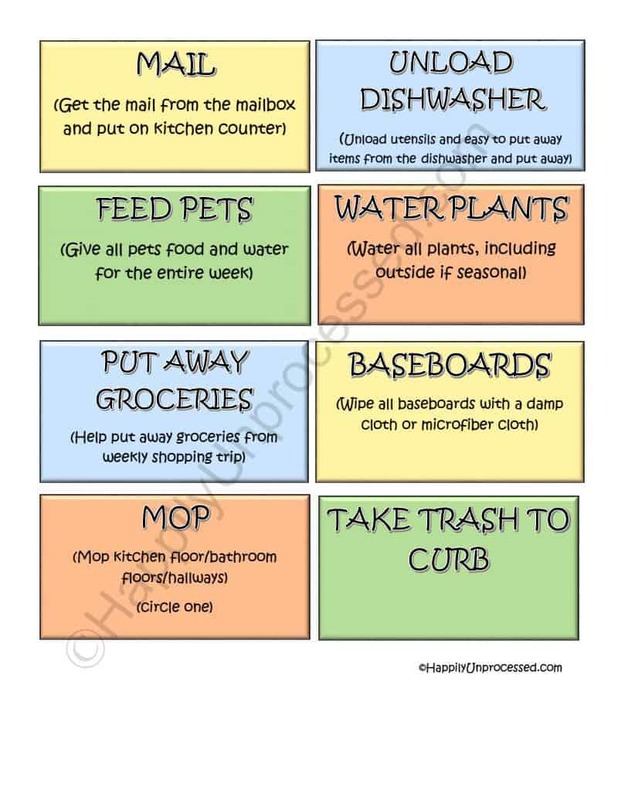 I love this idea for a chore chart. I would love a link or PDF for the job chart also. 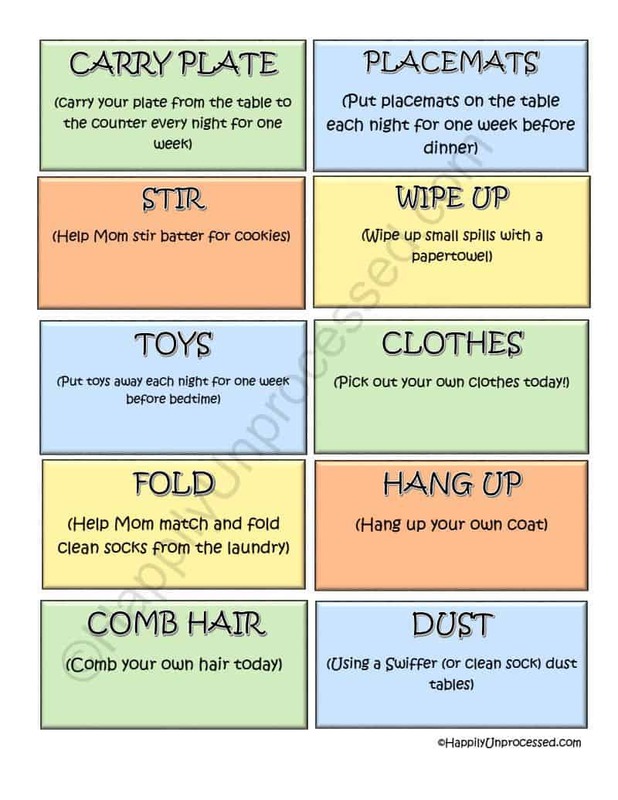 Love this idea…If you found the PDF for the chore chart, could you e-mail it to me? Thank you! 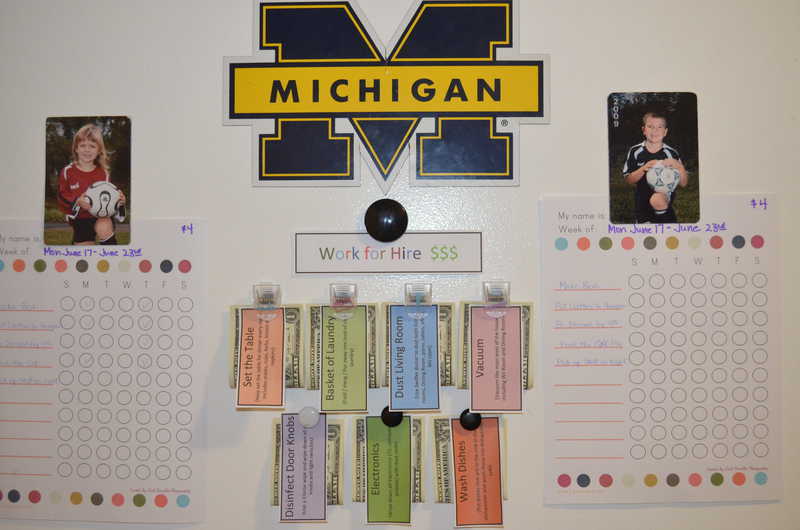 Nice and if it works for you great….but kids need to learn to do chores and be responsible with out getting paid. We don’t pay our kids for doing house chores . For them to not get paid to do their chores is one thing. We are talking about them doing extra things around the house. Basically mom and dad’s jobs. We are talking about kids here. I think it gives them an idea of what its like to have a job. We often tell them about us having to work and getting paid. This gives them a hands on example. Kids often like to pick up extra things from the store. We say no because we probably don’t have the money at the moment. If the learn to start saving their money then they can buy their own extra things. 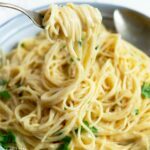 I love this idea & can’t wait to try it! What do you do if they miss a regular chore a day or two that week? Do you still give them their base salary or what? This is wonderful! 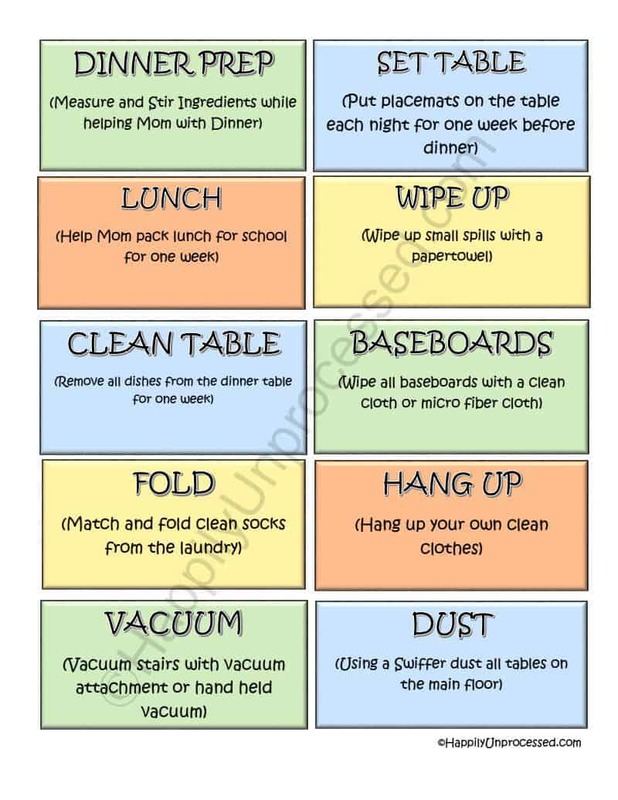 I have been all over trying to find the “perfect” chore chart/system for my 11 and 13 year old sons and I think this system is going to work fantastically for us! 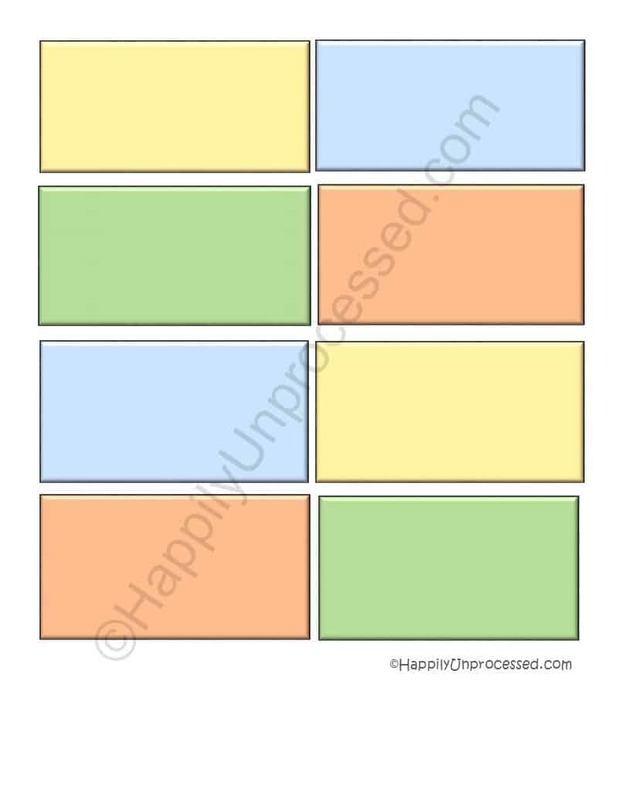 I’ve tried different charts and had the same results where they start off really well for a few weeks and then they’ll get down to nothing or me nagging each day to get them to do something. I will have to change a few items around (especially since we have a cat) but this is a great starting point. Thanks for sharing! you’re welcome Tana. I hope it works out well for you! Hi Amanda. My kids are about the same as yours and each Sunday morning we do chores together (b/c otherwise a puff of wind would distract them) and the little one is responsible for emptying all the trash in all the bedrooms/bathrooms into a big paper bag. She also makes sure all baths have soap, switches out clean hand towels, makes sure all have t paper, shampoo, conditioner, shower soaps. The older one sweeps out all the bathrooms and vacuums the bedrooms and hallway. 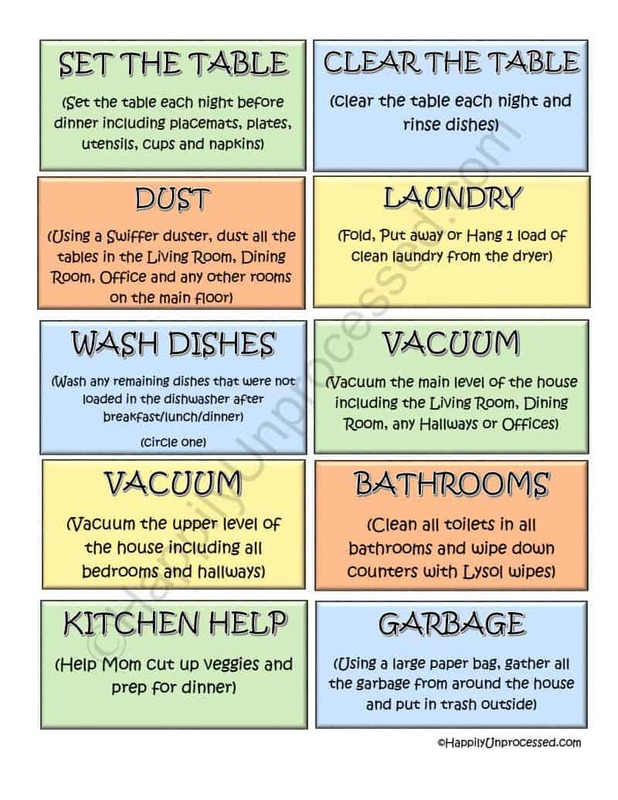 After that they are free to do the extra chores we have listed. They change as the seasons change. Right now they are raking and bagging leaves. Our property has quite a lot of leaves so they get paid by the bag and it can go on for weeks and weeks. I hope that helped! 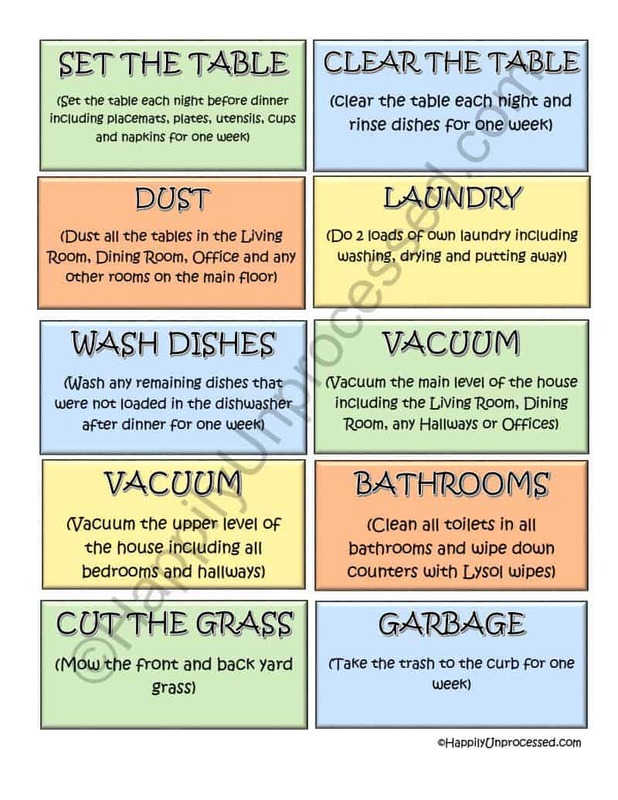 Do you have a printable of the Chore Chart? I didn’t see it? 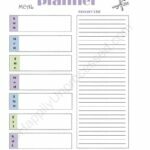 Great idea – you are so much more organized than me! 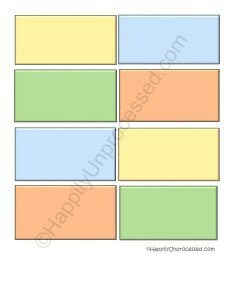 Do you have a PDF of the chore chart? I ADORE this system. I’m totally doing this. Also, if you DO find that personal chore chart on your comp, I’d love to receive it too. You did an awesome job! What do you mean, for this system we are giving them a base salary of $4 each. $4 at the end of each week or for each chore that done. 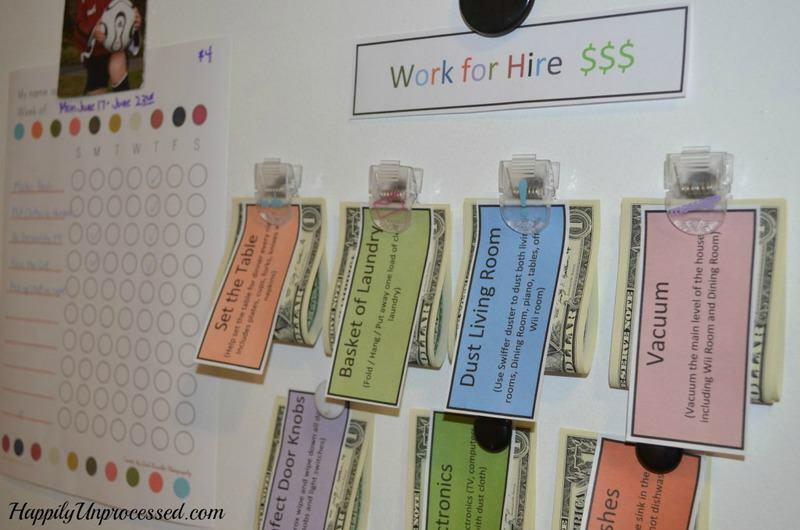 My kids get a base ‘salary’ of $4 for the WEEK and then if they WANT to earn extra money they can with the Work For Hire Chores, but it’s entirely up to them. Sometimes it’s not worth the money, other times they can’t earn enough! I’ve revamped this a little bit just recently in that I’m only putting one or two chores up at a time and sometimes I wait a day or two. It kind of dangles the carrot a little bit more if you know what I mean. Hi Felicia! I can check but I don’t think I do. I think I just typed it out. If I find it on my computer I’ll email it to you!